April 29, 2006, marks another milestone in New Horizons' historic journey to Pluto - the spacecraft's 100th day of flight. "It's been a good flight so far, and we're working to keep it that way," says New Horizons Mission Operations Manager Alice Bowman, of the Johns Hopkins Applied Physics Laboratory in Laurel, Md. Since launch from Cape Canaveral Air Force Station on Jan. 19, it has also been a busy flight. 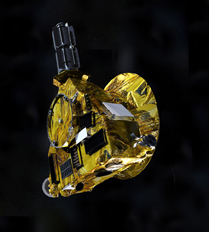 Among many activites, the mission team has conducted three small trajectory correction maneuvers, which exercised the spacecraft's propulsion system and refined New Horizons' path toward Jupiter for a gravity assist and science studies in February 2007; upgraded the software that controls the spacecraft's flight computers; and carried out rigorous tests proving that all seven onboard science instruments survived launch and have their basic functions. Having passed the orbit of Mars on April 7, the spacecraft continues to zoom toward the outer solar system, moving about the Sun at more than 69,570 miles (111,960 kilometers) per hour. "On a voyage to Pluto that will take nearly a decade, 100 days might not seem like much," says Alan Stern, mission principal investigator from the Southwest Research Institute in Boulder, Colo. "But the team has accomplished a lot in that short time, and the mission is going exceptionally well. Now we're working hard to calibrate the scientific payload and prepare the science instruments and spacecraft for our encounter with Jupiter, just 10 months ahead." The team will begin rehearsing for that trip through the Jupiter system - putting the spacecraft and instruments through the actual paces of the flyby - later this year, after the science payload is fully commissioned this summer.